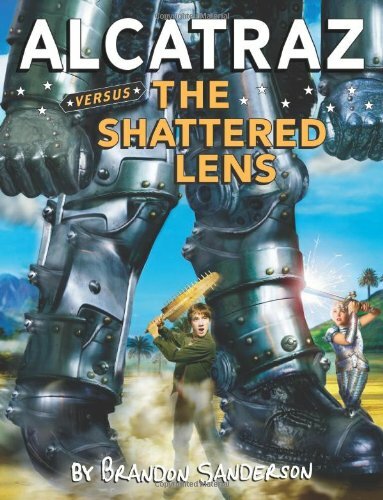 I picked up Book 4 of Brandon Sanderson‘s Alcatraz series (which his website describes as ” a humorous fantasy series for ages 9-99″) when I arrived home from work this evening. I turned the last page a little while ago. One thing I like about these books is that they’re such quick reads, I finished in an evening despite not actually reading for five hours straight. I even cooked and ate a quick dinner during the course of my read. Another thing I genuinely enjoy about reading Alcatraz Smedry’s autobiography, is how outrageously funny they are. Yes, they’re written for a Young Adult audience but I can assure you that they’re quite enjoyable to read when one is an adult. You should know this already, if you’ve read the previous three volumes of my autobiography. If, by chance, you haven’t read them, then don’t worry. You’ll get the idea. After all, nothing in this book will make any kind of sense to you. You’ll be confused at the difference between the Free Kingodms and the Hushlands. You’ll wonder why I keep pretending that my glasses are magical. You’ll be baffled by all these insane characters. Anyway, as I was saying, if you haven’t read the other three books, then don’t bother. That will make this book even more confusing to yu, and that’s exactly what I want. By way of introduction, just let me say this: my name is Alcatraxz Smedry, my Talent is Breaking Things. And I’m stoopid. Really, really stoopid, So stoopid, I don’t know how to spell the word stupid. I found myself laughing out loud quite often during the course of this evening and repeatedly wondered at how awesome a writer Brandon Sanderson truly is. He did something in this book that he hasn’t done in any of the previous Alcatraz books and I found it quite brilliant, to be honest. Rather than using the standard chapter headings, such as ‘Chapter 1’, ‘Chapter 2’, etc., Brandon was quite creative with his chapter numbers. Instead of the tired 1, 2, 3 bit… he used things like ‘Π‘ or ‘∞‘. Even ‘∞ + 1′. Some of my other favorites were ‘8675309‘, ‘42‘, ‘Act V, Scene III’, ‘24601‘, ‘6.02214179×10^23‘ and ‘NCC-1701‘. Once I reached the pi chapter, which was the third chapter after ‘Chapter 2’ and ‘Chapter 6’, I had to skip ahead and check out all of the chapter headings. I got quite the chuckle out of some of them, most notably Chapter Act V, Scene III during which all of the characters hilariously quoted Shakespeare’s Hamlet. With the exception of one Librarian, who had the wrong tragedy… erm, tragically. This entry was posted in 50 Books, review and tagged 50 Book Challenge, Alcatraz, book reviews, Brandon Sanderson, young adult. Bookmark the permalink. Good plan, Jill. Though you ought to give your locals a nudge and see if they’d keep a few in stock. Why should other shoppers suffer from their gross oversight?! Note: I did make a correction to this review. Not being very familiar with Shakespeare, other than to recognize a few quotes, I inadvertently mentioned the wrong play in my original review. I have since corrected the mistake and extend my apologies. Thanks for reading!